Styling-Polymers provide soft hold and volume. Color results perfectly aligned with Topchic, Nectaya and Colorance. Perfect consultation through evenly aligned GOLDWELL color cards. 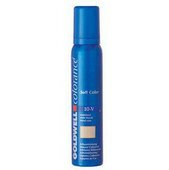 Quick and easy application with a brush or a comb – without rinsing. Apply to towel-dried hair. Do not rinse and style as usual.